Cornish MP Colin Breed is meeting the head of food firm Ginsters on Saturday to discuss getting protected regional status for the Cornish pasty. This status is a European initiative to stop locally produced foods being imitated by non-local brands. Taste of the West, which promotes local food in Cornwall, has also been fighting to get the pasty protected. Recent research found Cornwall's most famous fast food is worth more than £150m a year to the county's economy. Other well known products which have benefited from the ruling are Newcastle Brown Ale and Melton Mowbray pork pies. Cornish clotted cream also has regional status. South East Cornwall Lib Dem MP Colin Breed said the pasty was a "great Cornish achievement". He said: "The Cornish pasty needs to be protected as clotted cream already has been. "Obtaining protected status for the Cornish pasty would be a massive boost for the regional economy." 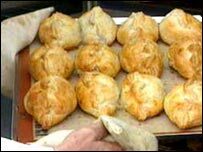 The Oxford English Dictionary suggests that the pasty was identified in around 1300. It became more commonplace in the 16th and 17th Centuries, and by the 18th century was firmly established as the staple diet of working men across Cornwall.